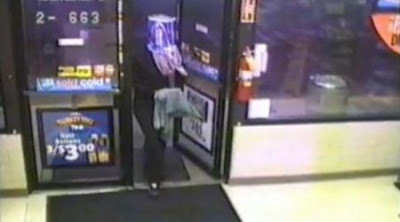 This week, a man in Nebraska robbed a convenience store using a disguise that was beautiful in its simplicity and cheapness-- he put an empty 12-pack of Bud Lite over his head and a towel over his hand (suggesting there was a gun underneath). The still-unknown man got away with 50 bucks worth of cigarettes. After the robbery, he dropped the box in the parking lot. It is being examined for finger prints. Some have suggested that the towel was in honor of Towel Day (May 25), which is celebrated by fans of The Hitchhiker's Guide to the Galaxy. That theory, however, assumes that this Mastermind actually thought about what he was doing. He may have just been covering his hand because he didn't really have a gun. For other disguise stories, click "disguise" label below.